With the help of a frilly dress, tiara and magic wand, your 3-year-old is transformed into the queen of a magical universe where her hobby horse is a winged unicorn. When you’re asked to taste the pink clouds, you agree that they’re a lot like bubblegum. Parents of preschoolers have a front row seat to some of the most imaginative theater ever produced. These are the so-called “magic years” — when a child’s brain is developed enough to imagine grand stories but not yet complex enough to reason the way adults do. 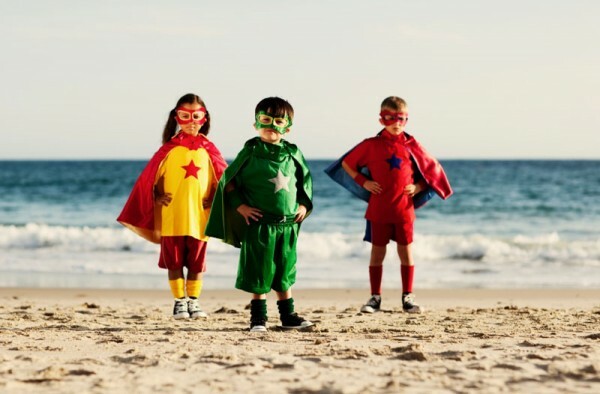 Pretend play lets kids try out new roles for themselves (like superheroes, princesses, wild animals, or even parents) and allows for creative problem-solving. But it also helps them deal with another hurdle of the preschool years: intense emotions. Baby dolls might be put in “time out” and scolded for actions suspiciously similar to your little one’s latest offense. An imaginary friend (who’s a bigger troublemaker than your child could ever be) might be conjured up to help your child deal with feelings of guilt and remorse following a moment of lost control, such as hitting a playmate. Self-control is a tough skill to learn, and pretend play helps kids practice it as well as play out the frustration it creates. Go along with it. When young ones leap through the air and tell you they’re flying, don’t tell them they’re only jumping. Instead, feed the fantasy: “Wow, you’re so high up! What can you see on the ground? Maybe you should take a rest on that nice puffy cloud.” Or even better, start flying with them. Choose old-fashioned toys. Blocks, dolls, arts and crafts, and molding clay are all toys that require creativity and spur imagination. Limit electronic toys. Try to avoid toys that need batteries. Creativity is stifled when the toy, rather than the child, directs the play. Read to your child. And while reading, ask mind-opening questions: “If you were the caterpillar, what would you eat?” “What do you think will happen next in the story?” This not only encourages imagination but promotes language skills and fosters an interest in books. Schedule downtime. Make sure kids have free time every day to play on their own. Aside from encouraging creativity, it teaches them to use their own resources to amuse or soothe themselves. Limit screen time. When kids watch a movie or even an educational program, they experience someone else’s make-believe world instead of exercising their imaginations. And some subjects on TV are not appropriate for preschoolers. Young kids also are more influenced by advertising since they can’t tell the difference between commercials and actual programs. Experts recommend that children over age 2 watch no more than 1-2 hours of quality TV per day. © 2012. Article adapted from The Nemours Foundation/KidsHealth®. Used under license.